A coffee shop-style instant cappuccino you can create in moments. We use natural, high quality roasted coffee beans. Made with simple ingredients like fresh milk from British farmers. Milky and smooth with a velvety froth. 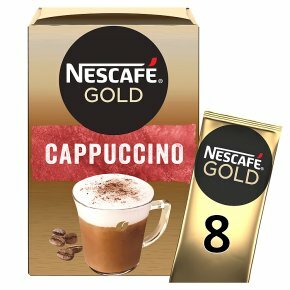 Savour each moment with 8 sachets of coffee shop-style cappuccino.Enjoy a NESCAFÉ GOLD Cappuccino whether you're at home or at work. No matter where your day takes you, take a break with a coffee that has been crafted by experts from beginning to end.